Omnitrans’ routes converge at several major transfer points, hubs where multiple routes converge to allow riders to transfer in a reliable and timely manner from one route to another route. As transfers are a critical part of the experience of riding transit, Omnitrans must provide secure, comfortable facilities for passengers to make transfers. Omnitrans’ major transfer points are divided into two different types. 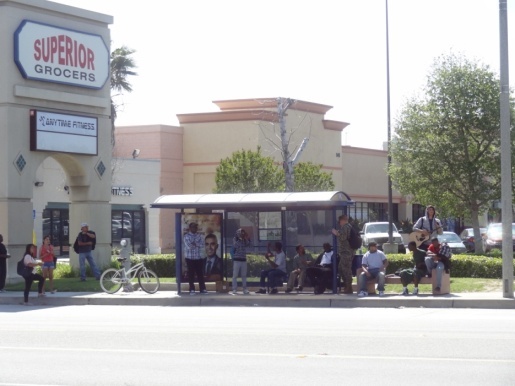 Transit centers are typically off-street facilities that provide timed transfers between many bus routes, multiple providers, and/or bus-to-rail connections. 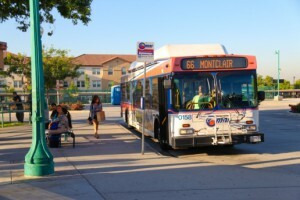 Pomona, Montclair, Fontana, and the planned San Bernardino Transit Center are examples of transit centers that provide connections between multiple bus routes and Metrolink rail service. 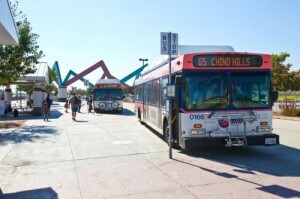 Chino, Chaffey College, and Yucaipa are examples of transit centers in the Omnitrans system that provide off-street connections between multiple bus routes but not to rail services. Transfer centers are generally on-street locations where buses share the road with vehicular traffic, and where transfers are provided between multiple bus routes, usually not timed. Transfer centers are typically located at shopping centers, malls, hospitals, universities, and other major activity centers. 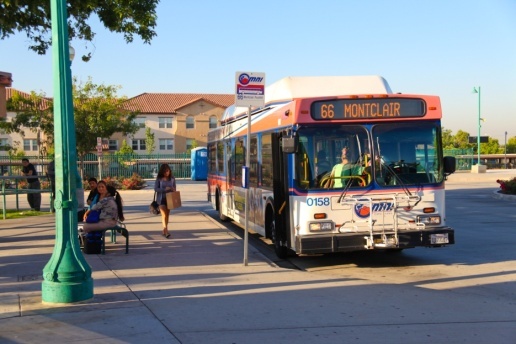 Many provide connectivity between Omnitrans routes and other transit services, such as Mountain Transit, Foothill Transit, Riverside Transit Agency, LA Metro, and Metrolink rail service. Transfer centers include the temporary 4th Street Transfer Center in downtown San Bernardino, Rialto Metrolink Station, Rancho Cucamonga Metrolink Station, Redlands Mall, South Fontana Transfer Center, and Ontario Civic Center Transfer Center. A transfer center is currently being planned for expansion at Ontario Mills Mall. Figure 17-1 shows examples of Fontana, Montclair and the 4th Street Mall Transit Centers. The ideal location and design for each transit center will depend on its intended purpose. For example, a transit center within a park-and-ride lot is better situated away from congestion choke points and congested areas but closer to highways and major roads. Transit centers that are intended primarily to provide transfers between different bus lines are better situated close to high activity locations with good accessibility to residential or commercial areas and other bus lines. In general, transit centers are better situated at a central location with a high transfer rate and corresponding high number of boardings, near accessible land uses that support high activity centers and communities. Omnitrans’ transit centers are major hubs of activity; the busiest hub in downtown San Bernardino currently has over 6,000 daily boardings, and the planned San Bernardino Transit Center will have projected 9,000 daily boardings in 2015 (including Metrolink, sbX, and 13 local bus routes). With the addition of rail ridership, future bus rapid transit ridership, and foot traffic attracted by other potential uses at the transit centers, these locations provide an untapped market for retail, dining, entertainment, and other uses that could serve transit riders and other community residents. In turn, uses that attract people to the transit centers and surrounding areas will increase ridership, and provide increased demand for mixed uses in the surrounding areas. Security features including lighting, ETELs, cameras, etc. For More Information please see Section 15 and Section 17 of the Transit Design Guidelines.